I love that this summer top was knit entirely in Utah. It will forever be associated with hoodoos and slot canyons in my mind. It's Just Beachy by Emma Welford, who also designed the Holla Back Tank I made last fall. 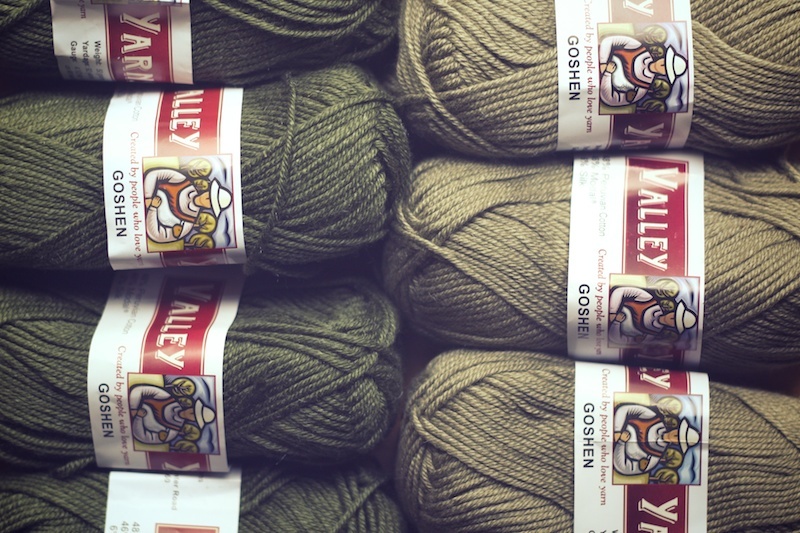 The yarn is Goshen by Valley Yarns in dark olive and sage. These colors even seem campy and are very, very me so I know I'm going to wear the heck out of this. I like the weight and feel of the Goshen, but I was a little disappointed in the number of knots I encountered. However, that didn't stop me from ordering more, on sale, for a Lace Striped Sweater in one of the brief moments where I found cell service on this trip. 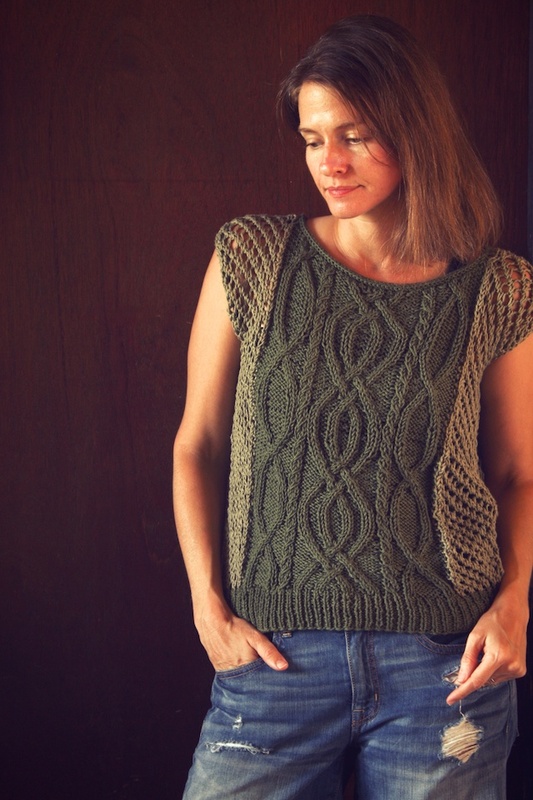 Check out the I-cord bind off neckline. 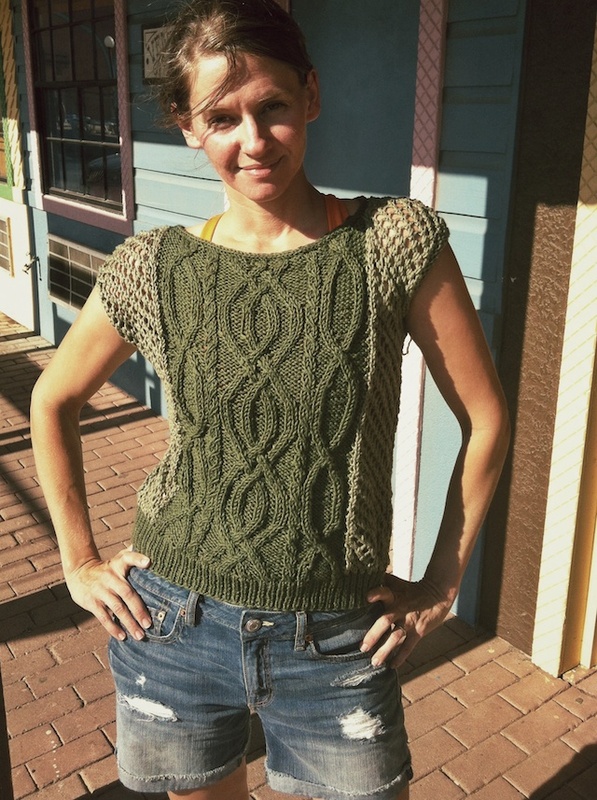 I used size 1 needles to knit the ribbing, then went up to 2 1/2's for the body, but the pattern calls for 6's and 7's. I didn't exactly think this through when I packed all of the yarn for our trip. Having three balls going at once in the truck would seem difficult to maneuver. But, I think the confined space made it easy to keep track of them. 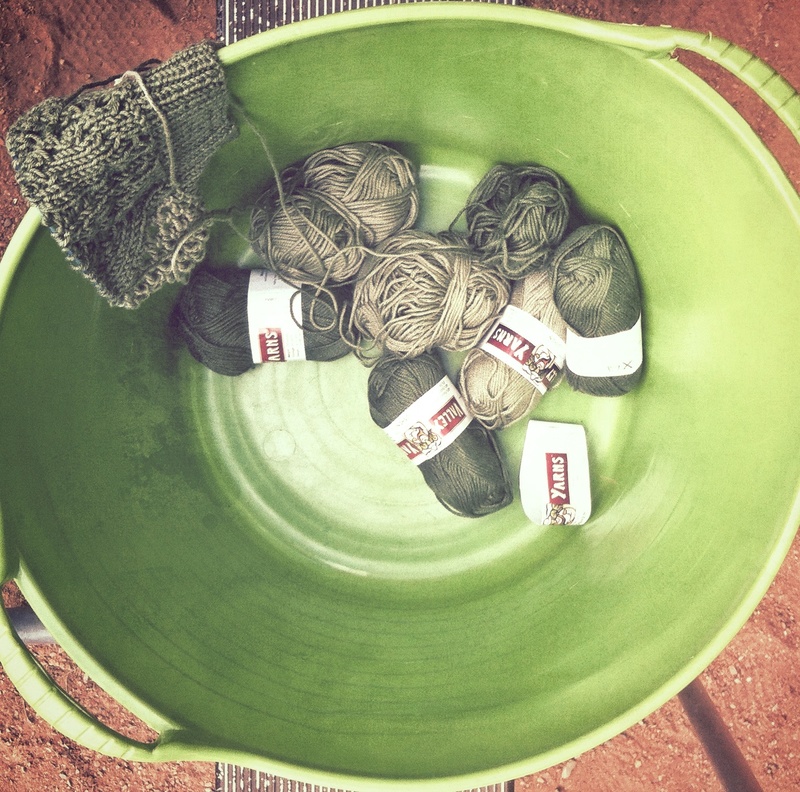 Around the campsite, I used a giant rubbermaid yarn bowl. No problem, but I wouldn't want to convert this to knitting in the round, though. I've never knit anything in vertical color blocking before, but I love it! I'm also digging these summer tops with no waist shaping. Knitting the mesh lace felt so natural after all of the lace I've been attempting lately and the cable pattern was just challenging enough to be fun without distracting me from the view. 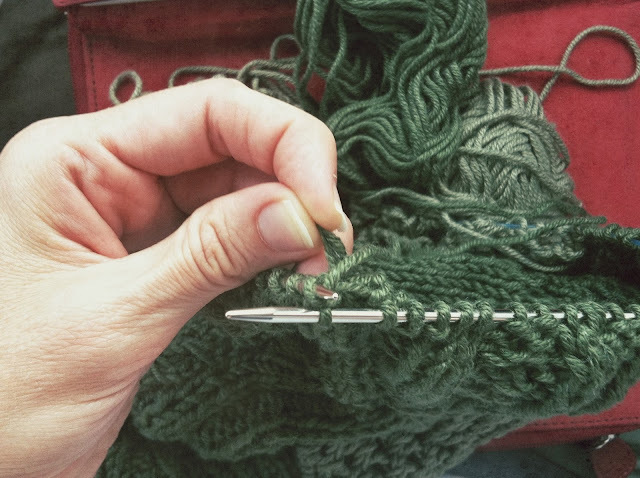 Normally, I'd have lost my cable needle one million times on the floorboard, but this was knit in a relaxed gauge, so I tried cables sans the needle and it worked great. The finishing on this made me a little nervous because I made a mistake in the lace very early in the knitting of one side and I thought when it was seamed with another piece of lace it might show. It doesn't, though. 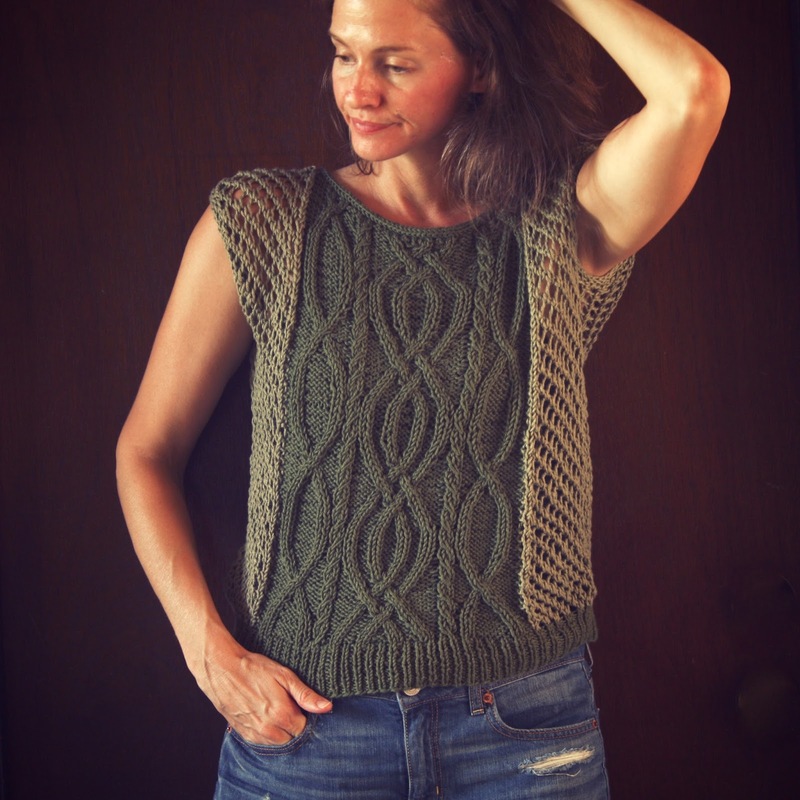 One last note- this knit up fast! Want to watch it grow? Here I am wearing it with strings hanging out at the worst hotel ever. (I really do own more than one pair of shorts.) 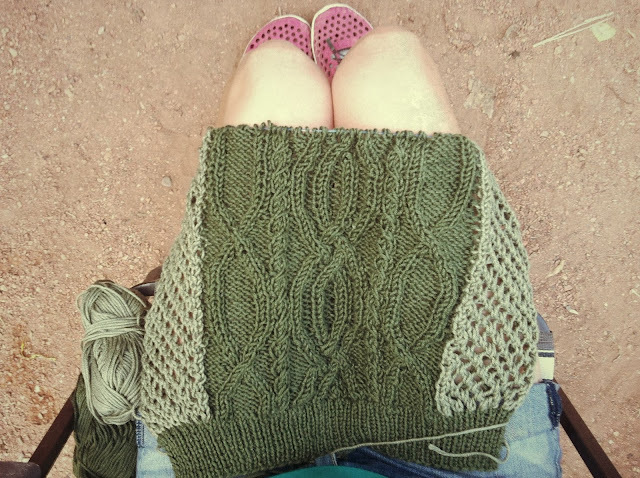 There is nothing like getting back from vacation well-rested, sunburnt, with a full memory card, and a couple of finished knits. This is one I am DEFINITELY knitting. I just love it - and I love the colors you went with. I'm thinking maybe brown and creme for mine? I thought one finished adult knit on holiday was very impressive, but 2!!! I love it! I do love it, too. It's amazing how though it's got a lot going on, like Nachtfalter, it seems more casual. But that might be my color choices. They make me think of the neutrals you used on Nachtfalter. It was so nice. I know! 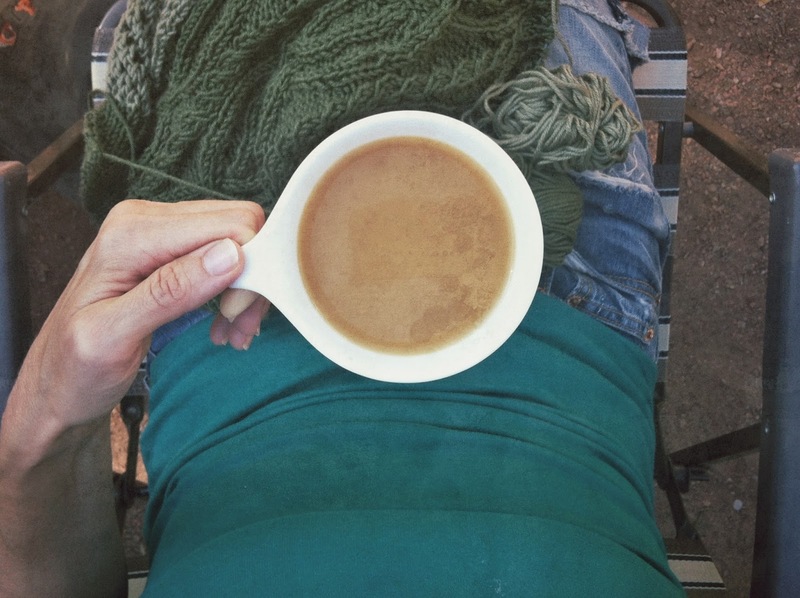 And I really did a lot of outdoorsy things, but the driving to different sites in Utah and Az allowed for much knitting. Thank you, Heather, I did too. One of the pattern samples uses more contrasting colors, which also looks nice. I don't have anything like this- I'm breaking my tshirt/ tank top monotony this year, so it's fun to wear. Just ordered persimmon and fawn to make my own! Love your photos. Terri, those colors will look so great together! Please let me know with a link or on ravelry when you knit it. I'd love to see it. It's so gorgeous on you! Heading to the beach for a week and packing my knits--hope I return w/ some FOs :)! This top looks lovely in you and indeed those are vacation colors. 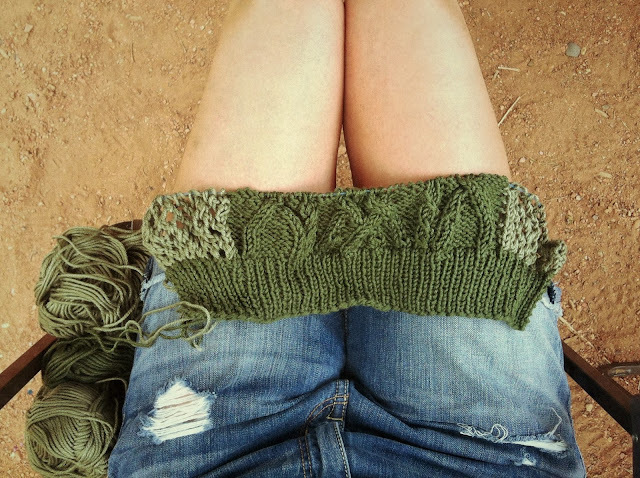 The fact of having it knitted there will remind you forever of Utah. I'm also knitting this week while we are at Koen's parents and I didn't think it through when packing yarn and needles, but we always find workarounds! Have fun, Sandra! 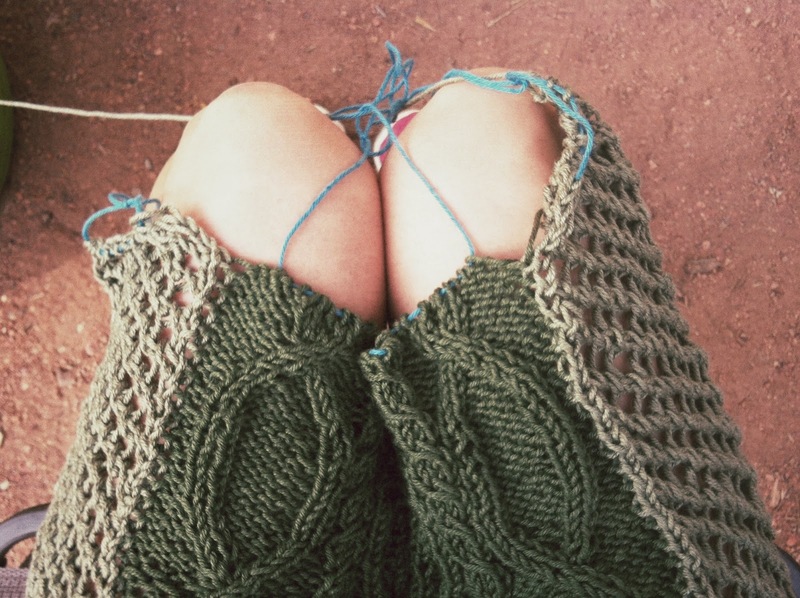 Beach knitting can be messy, but very satisfying!! Thanks, Elena! I hope you guys have a good visit and that you get some travel knitting accomplished. Thanks, Vanessa. This is a really cool design! It's surprisingly lightweight too! I can wear this year round here. A lovely top. I love associating projects to a place, a destination, this way they are more memorable. I ahev worked with valley Yarns before, and I like it as well.